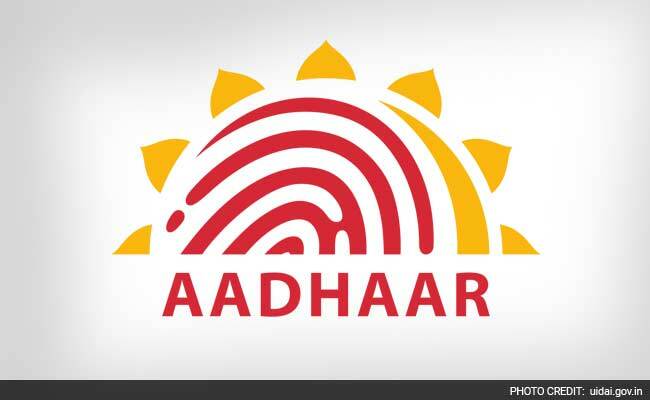 Users can log into the Aadhaar self-service update portal and submit a request to change Aadhaar card details in three steps, UIDAI said. The UIDAI or Unique Identification Authority of India, the regulator and issuer of the 12-digit Aadhaar number, now has enabled Aadhaar card holders to change their basic details such as address and phone number without hassle on its website. Called 'Aadhaar self-service update portal', this service allows users to submit requests to change the mobile number, address, email, among other details, fed into the Aadhaar database. "Mobile number is mandatory to receive a password for login," according to the UIDAI website - uidai.gov.in. This mobile number is the one registered at the time of applying for Aadhaar. Users can log into the Aadhaar self-service update portal and submit a request in three steps, the UIDAI website further said.These steps are: login with Aadhaar number, upload documents and select the service provider. Visit the UIDAI website to find and click on the 'Update Aadhaar Details (Online)' tool. This tool can also be accessed through its link. Enter your 12-digit Aadhaar number and click on 'Send OTP'. OTP or one-time password is sent by the Aadhaar system on the user's registered mobile number. After this, enter the OTP received in the specified field on the portal and click on 'Login'. On the next page, select address from the list and proceed. "Ensure that your information is transliterated correctly in the local language. 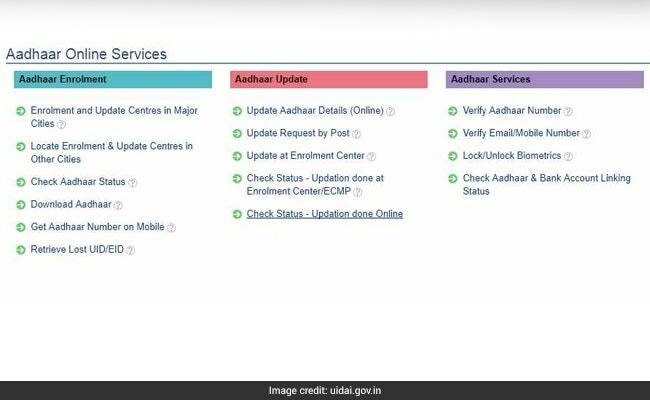 The English spellings in the local language boxes may be modified to get the local language spelling correctly...," according to the UIDAI self-service update portal. Check the details thoroughly and proceed. At this stage, the user is required to submit the valid document supporting the requested correction. Users are required to upload original scan copies of the valid documents. "Upload only the valid documents to avoid update request from rejection," the UIDAI noted. Select from the available service providers and proceed. The system also displays estimated time required to process your request. At the end of submission, a URN or Update Request Number is issued to track the status of application. A similar procedure may be followed to make changes in other Aadhaar details (name, date of birth, mobile and email). 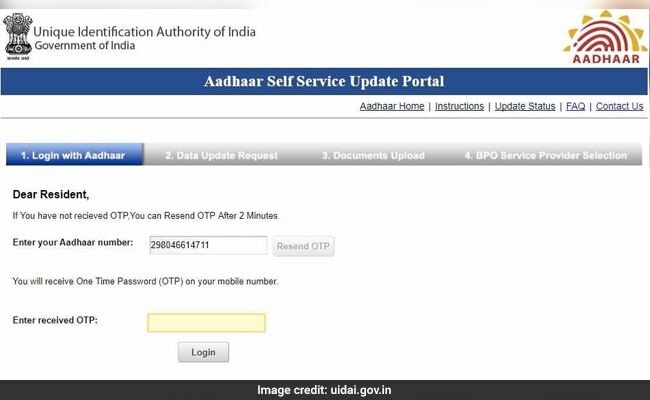 Login on the UIDAI self-service update portal by entering your Aadhaar number and OTP. On the next page, the tool displays the mobile number entered by the user. After this step, the portal sends an OTP to the new mobile number. Enter this OTP in the specified field to proceed by clicking on 'Submit'. After submission of request, the portal issues an Update Request Number (URN) for your request for change in mobile number. The documents required for address change include passport, bank statement/passbook, statement of post office account/passbook, ration card, voter ID, driving license, water bill and telephone landline bill, according to the UIDAI website. The bills for water, telephone and electricity must not be older than three months, it noted. Some other eligible documents include government photo ID cards/service photo identity card issued by PSU, property tax receipt (not older than one year), credit card statement (not older than three months), insurance policy, pensioner card, income tax assessment order, vehicle registration certificate (RC) and registered sale/ lease/rent agreement.